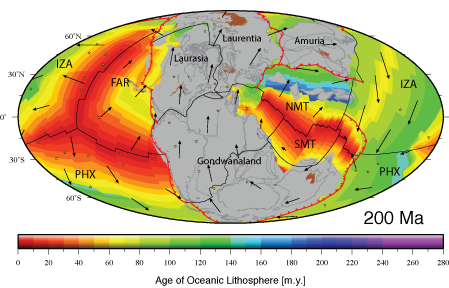 Global plate motion models provide a spatial and temporal framework for geological data and have been effective tools for exploring processes occurring at the earth’s surface. However, published models either have insufficient temporal coverage or fail to treat tectonic plates in a self-consistent manner. They usually consider the motions of selected features attached to tectonic plates, such as continents, but generally do not explicitly account for the continuous evolution of plate boundaries through time. In order to explore the coupling between the surface and mantle, plate models are required that extend over at least a few hundred million years and treat plates as dynamic features with dynamically evolving plate boundaries. We have constructed a new type of global plate motion model consisting of a set of continuously-closing topological plate polygons with associated plate boundaries and plate velocities since the break-up of the supercontinent Pangea. Our model is underpinned by plate motions derived from reconstructing the seafloor-spreading history of the ocean basins and motions of the continents and utilizes a hybrid absolute reference frame, based on a moving hotspot model for the last 100 Ma, and a true-polar wander corrected paleomagnetic model for 200 to 100 Ma. Detailed regional geological and geophysical observations constrain plate boundary inception or cessation, and time-dependent geometry. Although our plate model is primarily designed as a reference model for a new generation of geodynamic studies by providing the surface boundary conditions for the deep earth, it is also useful for studies in disparate fields when a framework is needed for analyzing and interpreting spatio-temporal data. Paleo-age grids used by Seton et al. (2012) are available for download here. M. Seton, R.D. Müller, S. Zahirovic, C. Gaina, T.H. Torsvik, G. Shephard, A. Talsma, M. Gurnis, M. Turner, S. Maus, M. Chandler, Global continental and ocean basin reconstructions since 200 Ma, Earth-Science Reviews, Volume 113, Issues 3-4, July 2012, Pages 212-270, ISSN 0012-8252, 10.1016/j.earscirev.2012.03.002.